Kira Lewis Jr. - 6'3 - 160 lbs - Freshman - Originally a top 30 recruit in the class of 2019, Kira reclassified to 2018. His addition comes at a good time as the team was in need of a point guard following Collin's departure. While I wouldn't consider him as far along as Collin was as a freshman, there is no doubt Kira is a talented player with a high ceiling that will likely compete for major playing time from day one. That said, I do think fans need to temper their expectations. Keep in mind in what should be his senior year of high school, Kira is instead going to be playing in what many expect to be one of the top conferences in college basketball. That could make for an uneasy transition, at least early in the season. Avery Johnson Jr. - 5'11 - 187 lbs - Senior - Avery has received his fair share of grief from fans because of his relation to the head coach, but the truth is he's been a steady player and teammate during his time at Alabama, and he'll be needed this season. Point guard will be a question mark for this team this season so Avery's experience at that position will be vital. He was one of only two players who played in all 36 games last season, finishing 8th on the team in minutes per game (13.9). His averages for the season were 4.3 ppg, 1.0 rpg and 0.8 apg. Herbert Jones - 6'7 - 200 lbs - Sophomore - I've got Herb with the guards, but he's such a versatile player he can play as many as four different spots on the floor and be quite effective. His offensive game needs work (40.8% FG, 26.9% from 3, 50% FT), but he was probably Alabama's best defensive player last season. While he did have his ups and downs as a freshman, his overall potential was easy to see and I'm excited to see how far he's progressed over the summer. Herb played in 35 games last season, finishing 6th in minutes per game (21.2). His averages for the season were 4.2 ppg, 3.5 rpg, 1.3 apg and 1.2 spg. Dazon Ingram - 6'5 - 207 lbs - Junior - Just my opinion, but I believe Dazon was the most underappreciated player on last season's team. He was the epitome of steady, finishing top five on the team in all of the major statistical categories (points, rebounds, assists, steals and even blocks). He was also second on the team in minutes per game for the second straight season (28.8). He's definitely a guy that the coaches and teammates can trust at this point in his career. While other guys on this team may garner more attention from fans and media, I'm not sure there's another player on this team, with the possible exception of Herb Jones, that can do so many different positive things for this team. Dazon's averages from last season: 9.7 ppg, 5.7 rpg, 2.6 apg, 0.9 spg. Diante Wood - 6'4 - 175 lbs - Freshman - The Alabama 1A Player of the Year as a senior, Diante had a fantastic high school career. His school - Sacred Heart Catholic - won 1A state titles all four years he was there. That winning experience should serve him well as he begins his college career. Nevertheless, I'm curious to see how Diante fits on this team. There's plenty of experience and talent returning at guard so minutes will be at a premium. Diante's best days may be in future seasons. John Petty - 6'5 - 195 lbs - Sophomore - JP's struggles on the road were well-documented last season, but it's hard to argue with freshman numbers of 10.2 ppg, 2.6 rpg and 1.8 apg. He played in all 36 games, and was third on the team in minutes per game (28.5). All in all, he had a good freshman season. Most of John's struggles on offense last season stemmed from his over-reliance on the three-point shot. If he develops other ways to score, his offensive numbers should rise significantly in year two. It's easy to forget because of the season that Collin Sexton had, but JP was the type of impact high school recruit that you can build a program around. The hope here is that he reminds people of that in his sophomore season. Lawson Schaffer - 5'11 - 168 lbs - Senior - Yes, believe it or not, but Lawson will be a senior this season. As I wrote in the roster preview last season, Lawson may be a walk-on, but he is a talented guy that likely would have been a star player at a different level of college basketball if he had chose to go that route. In case you forgot this fact, go back and watch his performance in the game vs Memphis last season. 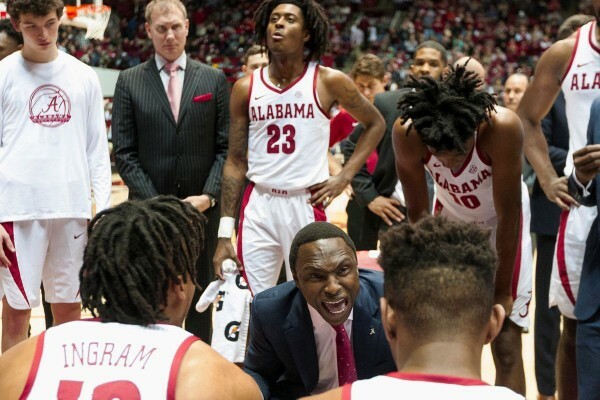 His 11-minute, 5 pt performance in that game was crucial in helping Alabama overcome foul trouble in the first half and ultimately win the game. The returning and incoming talent likely means his role doesn't change much as a senior, but his status as the crowd favorite will likely remain intact. Tevin Mack - 6'6 - 223 lbs - Junior - In terms of impact transfers, Tevin should be among the best in the country. He had a productive, if troubled, two years at Texas. Assuming the personal issues that led to his departure from Texas are in the past, Tevin should be a vital member of this team. His talent isn't in question, and if he remains healthy he has a great chance to make one of the two All-Conference teams when this season wraps up.